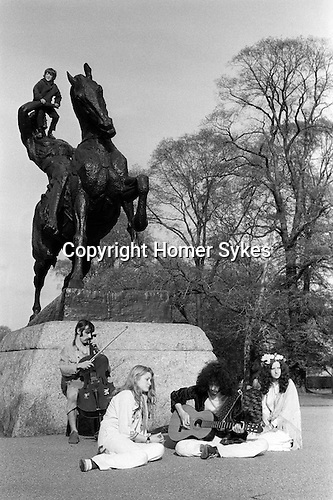 Flower power; hippies in Kensington Gardens make music under the Physical Energy statue, by George Frederick Watts, who said that the statue was, "a symbol of that restless physical impulse to seek the still unachieved in the domain of material things." Flower power was a term coined in America by the Beat poet Allen Ginsberg as a peaceful alternative to the Vietnam War. Be Sure to Wear Flowers in Your Hair, became the unofficial anthem of the 1960s counter culture movement.